The software racket is like anything else: there are loud projects that get a lot of attention but don't actually get much done, there are heavyweights that move in and make sure things get done, and there are the quiet ones that work with their head down, diligently, only to turn up at the finish line with a work of art. In this analogy, Kdenlive is my personal heavyweight, but Flowblade has lingered in the background, developing and improving into a surprisingly effective and efficient video editor for Linux. So why use Flowblade over other options? I have several good reasons; here are ten of them. 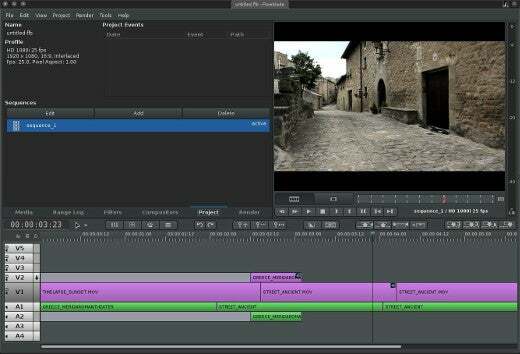 Flowblade is a surprisingly lightweight application, which isn't a common trait among video editing applications. Of course, saying this about a Linux application can be deceptive, because Flowblade itself is essentially a front-end for MLT and FFmpeg, but complexity under the hood and file sizes aside, Flowblade is designed for cutting video. It doesn't have twenty extra features that only apply to video peripherally. 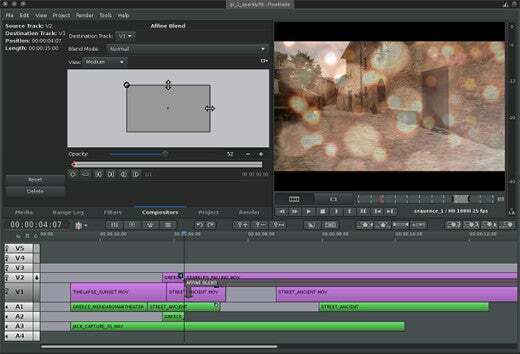 The features it does have are a laundry list of all the common must-have requests from working editors; there are all the usual video cutting tasks, a full set of visual effects, some basic audio effects with keyframing, and exporting. That's it. Just everything you need, without any of the extra bells and whistles to get in your way. Video editors are famously complex, so how can an application that can fit all of its functionality in a single row of buttons claim to be a serious editor? Quite effectively, as it turns out; all of Flowblade's primary functionality does indeed fit in about ten buttons in the middle button bar of the interface. Additional buttons are present for some detail work (zooming in and out, undo and redo) but most of the application fits in one horizontal toolbar. Better yet, all the major functions are assigned to keyboard shortcuts, so once you get into the swing of things, the editing process becomes fluid, and even graceful. Even if you've never used Flowblade before, you'll fly through hours of footage and end up with a rough assembly in next to no time, making it easily one of the simplest editors I've used. 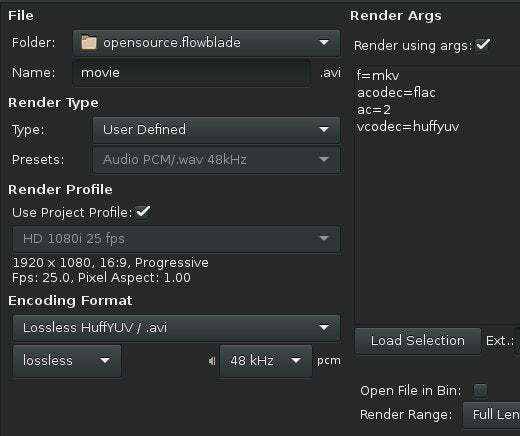 Flowblade benefits from the same set of video effects that nearly every Linux video editor has: the Frei0r. What that means is that you inherit a bunch of great video effects that are already written and ready to use, plus you get the great front-end user interface (UI) that Flowblade's developer provides you. When I first wrote about Flowblade in the Linux Format magazine a few years ago, its effects UI was backwards. Literally. 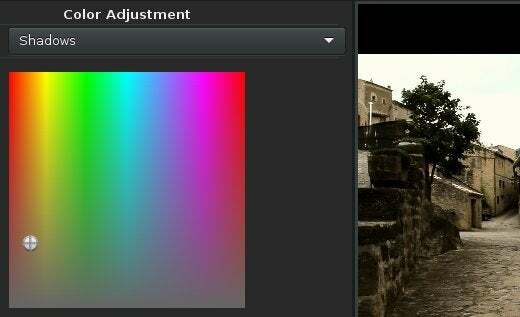 The UI of the colour correction, for instance, worked in reverse. But that's been overhauled now and the UI is one of the best front-ends for Frei0r effects that I've seen. The effects are intuitive, stack-able, and they look great. But wait, that's not all. Lately, Flowblade has even integrated the G'MIC filters, made popular by GIMP but so rich in features that it's really an application in itself. In other words, you have plenty to choose from. I'm a traditionalist. I don't bother mixing my audio in my video editor. But many people do, either because they have to or because they haven't been trained on an audio mixing application, so it's not uncommon for an editor to ask that their application have at least basic audio mixing close at hand. Flowblade provides. It's got the obvious volume mixer, plus a few extras, like panning and even swapping channels. Even better, it's got the easiest and most comfortable keyframing system I've seen in a Linux editor so far. 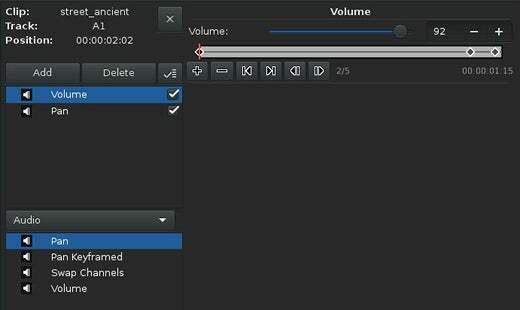 I imagine even if you've never keyframed anything before in your life, you could probably figure this one out; add a keyframe, set your volume, add another keyframe, set your new volume. It's simple, it's intuitive, and it's effective. 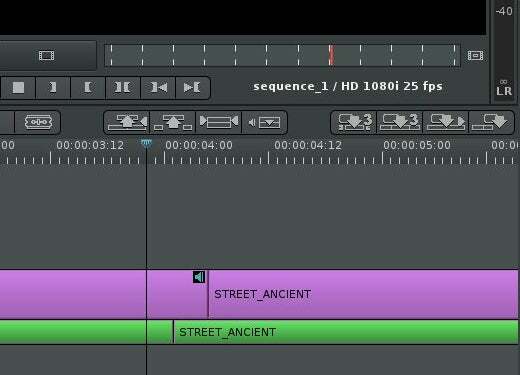 You hear the changes immediately, it plays back smoothly, it's exactly what a smash-and-grab video editor wants. Flowblade has consistently amazed me at the smoothness of its playback. Admittedly, MLT has improved and my computer has gotten a better graphics card, but Flowblade has crunched through my video in ways it just doesn't seem a lightweight editor has any business doing. It's by no means magick, and I wouldn't bet the farm on smooth playback under all conditions, but from the viewpoint of living in a video editor for days at a time, I can say comfortably that Flowblade performs well under the typical "Let's throw this effect on the footage for now, and see what happens" workload. Sure, if I pile on too many effects then I have to create a temporary render of a clip to properly audition the effect, but for quick reference, it does great. Eventually, any working editor has to decide how they want their application to deal with realtime effects. So far Linux editing apps mostly leave it to the user, which is good because that means that you can use Flowblade on a five-year-old laptop, or on the latest and greatest custom-built desktop. The payoff to that flexibility is that you get to manage your own previews. But if you're too much in the flow of editing to be bothered, you can at least rest assured that Flowblade will do its best to keep up with all your crazy ideas. The film school I attended forced its first year students to work in Super 8 film. We had to shoot, develop, and hand-cut celluloid, using wax pencils to mark our in and out points and cello tape to join our splices. A side effect of this training was that most of us learnt to be pretty adaptable in what tools we could use to cut footage together. It's akin to learning to drive a stick shift. Cutting to the chase (so to speak), Flowblade is both a traditional film-style editor as well as a friendly drag-and-drop video scratchpad. 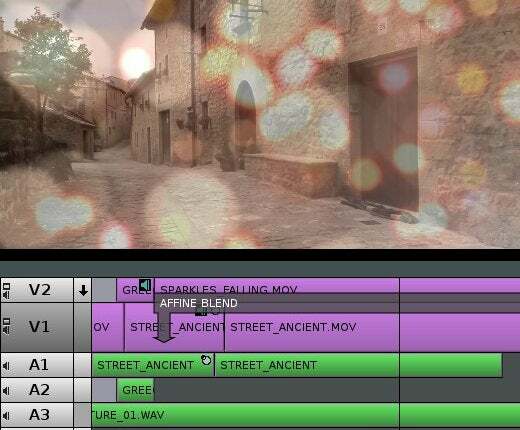 By that, I mean if you're an editor who thinks in Timecode (or SMPTE) and A-and-B (a style of conceptualizing editing), and sees video as just a visual reference to your EDL (edit decision list), then Flowblade accommodates. But if you're more a visual person who likes to get down in the timeline and click and drag clips around, Flowblade lets you do that, too. Flowblade uses the float: left rule that's become popular in editing applications lately, so when you add a clip it defaults to snapping to the clip to its left. But by using the Overwrite cursor, you can un-float a clip and move it anywhere in the timeline you please. Gray matter filler is placed between your clip and whatever is to its left in order to mimic a sort of celluloid base layer. Since Flowblade uses FFmpeg and MLT as its foundation technologies, there are plenty of options when it comes to delivering your work. You can use the inbuilt render UI, which makes the process pretty innocuous; it defaults to match most of your project settings, so at worst you'll end up with something that's appropriate. If you prefer to override some settings, there's a panel right in the UI for that. Better still, you can forego the inbuilt UI and render from the command line using the MLT back-end, so if you need to farm rendering out, you have the freedom to do that. What does "durability" mean in the context of a video editing application? It might be easier to explain what's not "durable" in a video editor. For years, video editing applications have been islands to themselves. There have been some stabs at interchange formats, and there are generic edit decision lists, but mostly if you use one editing application, you are stuck with it. Which means you're completely out of luck if that application disappears or suddenly changes its formats. Flowblade protects your art. By using common MLT formatting, open standards, and open source, you never have to lose an edit again. A project you edit today will be available to you for years to come, and will be portable no matter what. I'm not saying you can open Flowblade projects as an afterthought in any other editor as if all open source video applications talk exactly the same language, but I am saying that it's transparent in how it works, so there's no reverse-engineering or hastily-prepared aftermarket conversion tools that you'll need five years in the future. You own your data, and you own the application that helped you make it. And that, sadly, is a unique thing in modern art technology. Did I mention Flowblade was fast? It's not that Flowblade does anything too differently from any other video editor, it's just that it doesn't do anything extra that ends up slowing it down. It's a responsive application, and a pleasure to use. And it's not just fast in normal operation, it has lots of hidden little convenience features that you don't even think to look for until you need it. Little touches like Sync All Compositors, which auto-adjusts the length of composite effects with their parent clips, proxy management for when your video is just too big to be fast, media re-linking, and so much more, as if it's geared to make sure you spend less time fiddling with the editing application and more time editing. At the same time, it makes sure the application isn't wasting your time adjusting UI elements until you decide it's necessary. OK, OK, it's Murphy's Law that when you need an application to not crash, it will crash, but Flowblade (running on Slackware, at least) is a stable application. Look through its bug reports on Github and you'll see crashes, you'll see glitches, but my measure of stability is a little less granular. Stability is sometimes more a feeling and it's measured in how much dread you feel when your finger is hovering over the icon to launch the application, or before recommending it to a friend or co-worker when they ask "Say, what's a good video editor for Linux?" So, for the record: I launch Flowblade with confidence, I enjoy my time in it, and I heartily recommend it to friends. Including, dear reader, you. This editor might be great. But without displaying the audio signal, it is not possible to sync video and audio with a clap. This is a basic feature. This is definitely something developers should fix asap to become a serious editor. 2. Select "Display Audio Level"
This doesn't happen in the background, currently, because (as I say in the article), the Flowblade model (consciously or not) is to provide the basics and then allow the user to request more as needed. It keeps the interface fast and lightweight, and it's one of the reasons I've been enjoying using it so much at work, where we edit huge video files, so the fewer processes I have to wait on before getting started, the better! Actually, looking through bug reports and feature requests, Flowblade apparently now has the ability to render audio signals in the background, pre-emptively. I guess I just keep them turned off because, as I said, I rarely bother looking at the waveforms and just use my ear and the audio level readout. I gave it a shot but fifteen seconds in, while trying to load some .OGV files, it crashed. I edit .ogv regularly in Flowblade without issue. This isn't the place for extensive troubleshooting, but I'd check what versions of FFmpeg and MLT you have installed, and possibly update those if possible. As a basis for comparison, I use ffmpeg 3.1.1 at home and work; MLT 6.0.0 at work, MLT master at home. AFAIK this editor does not have `Razor`-tool and can’t split an edit in two. 1. 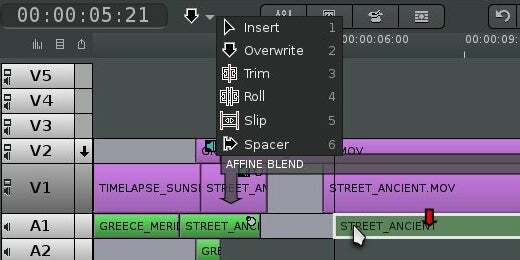 Position your playhead over the clip in your timeline that you want to splice. The selection modifiers on the left side of the timeline can be used to cut through multiple layers of clips at a time, but that's getting more complex than is easy to explain in a comment. Maybe an idea for a future article! I'd never heard of Flowblade before, it looks great! Does it support 4K video? I can't see 4K listed as a project profile. I could be wrong, and as of this comment I have not investigated because although I deal with 4 and 8k video at work, I proxy them down for editing (especially since most client review systems don't even support 4k playback). So as far as I know, Flowblade doesn't do 4k, although a new proejct definition shouldn't be TOO hard to make, if you were really determined. The problem we have with 4k at work is that so few codecs really manage it well within the color space we require, so it's really only used as an output format, currently. I imagine that as it slowly becomes easier to work with, Flowblade will integrate it. I haven't seriously looked into making a profile for it, though. Long time Kdenlive user here, with a background in videotape editing from decades past. I wouldn't mind learning a new editor. How's the learning curve for someone who already knows Kdenlive? Easy. I use Kdenlive quite a lot, as well (in fact, I wrote an extensive series on using it for opensource.com, you should check it out!) and Flowblade is pretty easy to pick up. It's a little different, maybe a little less draggy-and-droppy and more calculated (which you may appreciate as a former tape editor), but overall it should feel pretty natural to you. I tend to use Flowblade for quick edits and edits on my laptop. Kdenlive is the one I brood in and run on the desktop. That's just me, though. It's just nice to have options! Just for giggles, have you thought about covering Blender as a video editor? I've started using it and formerly hated it because I really needed to know the shortcuts to use it well. Switched to other editors such as Kdenlive and Flowblade but went back to Blender after I had more or less mastered the controls to Blender. It really is cool but I will say not for everyone. Anyway, Floblade is an awesome choice and you did an informative review. I used to use Blender exclusively for video editing before Kdenlive 0.8 - this was back before all the nice three-point systems were hacked together for it. I am still keen to use Blender as an editor, but ultimately there are some workflow things I just can't get used to; for instance, I can't get the rendering step to be multi-threaded (I mean, without creating a render farm), so my renders (with full colour correction on EVERY clip) takes about a day (for an hour of fully-graded video), and the effect stack has always felt a little wonky and backwards. That doesn't mean I don't ever use it for video, because I do, but right now I avoid it for big projects. And hey, with other great options like Kdenlive and Flowblade, I have the luxury to make that call. There are all you need, from updated keyboard shortcut to improve the video editor view. 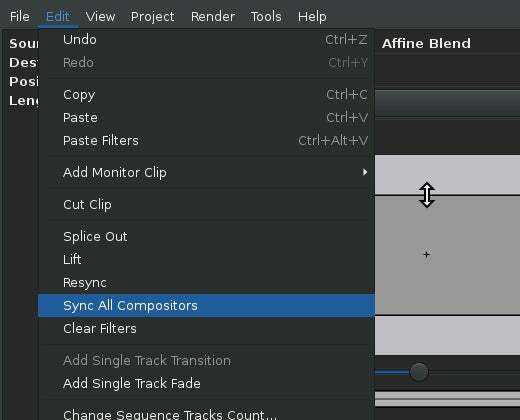 And if you need better sound editor, you can sync Blender with Ardour. Is it able to do frame-accurate editing of H.264 files? I have been looking for such a beast in the Linux world for years, to avail. Well, h.264 "frames" are divided into many different kinds of "frames", not all of which are complete. Even outside of Linux, you cannot do "frame accurate" editing of an h.264 because not all frames exist in an h.264 file. To be frame accurate, you have to transcode. It may be that an editor invisibly transcodes for you, behind the scenes (so to speak), into an intermediate codec, so it *seems* like you're editing every h.264 frame, but actually you're editing the intermediate codec. tl;dr No, it does not do frame accurate editing of h.264, because there is no such thing. You can, however, transcode your source to a good intermediate codec and edit *that* with frame accuracy. It's confusing, and I wish we video people would stop talking in "frames" but I guess it's still a useful concept.. The many different kinds of frames are three. :) You say some are "not complete" and maybe you are right but that should not stop the software to find out how the frame at a specific moment looks. An incomplete answer to the question would be: it depends on MLT, the backend used by Flowblade, Kdenlive, Shotcut. OK, if we're going with functionally defined frame accuracy, then yes, Flowblade edits h264 with frame accuracy. 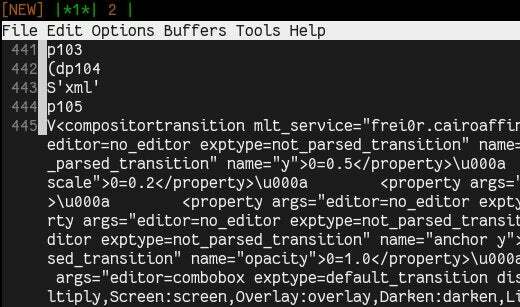 But as ttoine and Alex say, many other editors using MLT do, as well, so I'm not sure what issues YKD (the OP) is having finding this functionality on Linux. Maybe I'm missing something in the question.